A few summers ago while enjoying a short vacation in Newport, Rhode Island, Anne and I stumbled upon The Redwood Library and Athenæum. The lure of the Cliff Walk, the numerous mansion museums and the always inviting kite flying area generally dominates a visit to Newport but this time, while enjoying a stroll through the old town neighborhood, we discovered the "oldest lending library and the oldest library building in continuous use," in America. 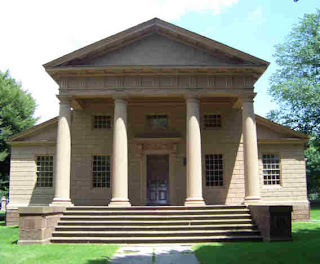 I'm pretty certain that the summer crowds that visit Newport are rarely wondering about this old library but they should as it is a building to honor and an institution to celebrate. The Redwood Library (read a brief history here) was founded in 1747 by Abraham Redwood and associates and opened in 1750. 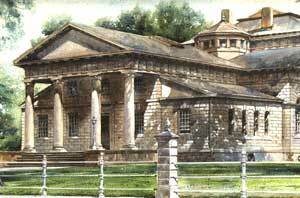 The building was designed by Peter Harrison (1716-1775) and was the first example of classical style architecture in North America. The building design is Roman Doric and perhaps based on drawings from a 1735 edition of Andrea Palladio's Architecture. The foundation of the lending library was a collection of 750 book purchased in England in 1749 by Redwood and shipped to the library. Today, about 90% of the original collection remains in the Special Collections of the library. The library is trying to replace those volumes lost over time, especially during the Revolution when the library was used as an officer's club for British forces. The original collection was comprised of books of interest in the mid- eighteenth century and included books on ship building, classic literature, law, religion, science and art. A complete overview of the original collection is available here. I hope you do visit The Redwood on your next trip to Newport. It is worth a visit simply to learn about the history of the library, the architecture and the original collection. Going strong after 261 years, The Redwood is an important library and cultural treasure.